Can you merge two retailing ideas but also ensure each stand out? The answer is not as tricky as it may sound. 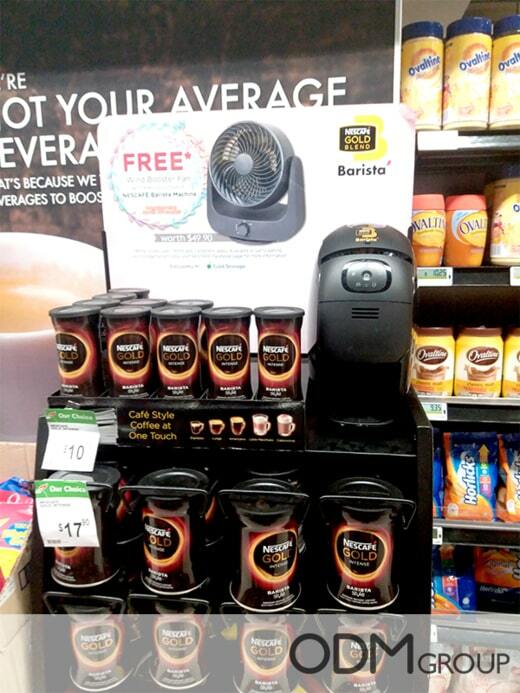 Nescafé, being a brand with decades of experience, has achieved just that in their new promotion in Singapore. 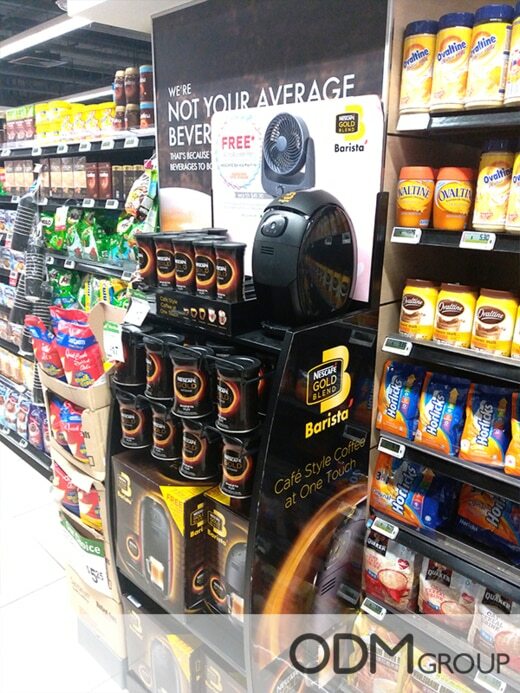 In fact, they have a cool POS display topped with a GWP ad for a free mini fan. Let me discuss both cases in full below. 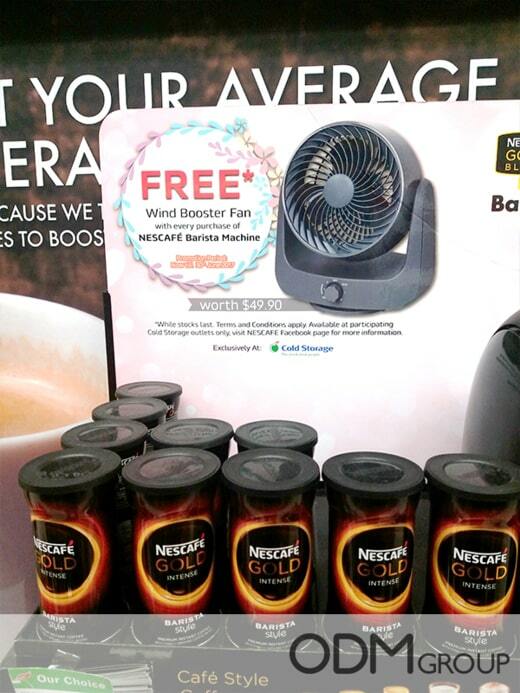 The wind booster comes with every Nescafé Barista Machine bought. The fan, although small, seems super portable from the get-go. It has a strong base which ensures that it won’t ever get knocked over. You can set it up on a work table, a study desk, or even a car dashboard as well. The curved design on its face allows the air to reach more people as the head flips up and down. The rotating knob looks old school, but the functions are not. Actually, the gift with purchase offers three fan and swing speeds. There is a silent mode for each, so consumers with babies can use it. What’s swell about a free mini fan is that you can market to different age groups. The cold weather only lasts for a while, after all. Once that passes, every man, woman, and child can appreciate the cool air that the promo gift gives off. It isn’t difficult to appreciate the set up of this rack. The machine becomes meaningless without coffee; that’s why the consumers have to see them both in one place. To fulfill that need, the brand customized the in-store display to have space for the caffeine containers and the boxes. The number of items found here, however, cannot reduce its design appeal. The dominating black color increases the café feel of the stand. The sides look slightly glossy as well, judging from how the closest shelf reflects on it. Reasonably Priced. Is it expensive to produce both the GWP and the framework? Well, no, especially if you do what Nescafé did here. They constructed the shelf with a cardboard material and the fan with durable plastic. You can have them created in bulk to cut the costs of manufacturing. Classy. Baristas have this elegant vibe that can charm consumers every time. The brand needed that to show through the advertisement because of their promotional product, and you bet it did! The cardboard POS display, despite the cheap material, has a gorgeous black finish. The free mini fan, meanwhile, resembles a desk fan that has kept people feeling fresh for many years. Nicely Labeled. There are times when customers find it hard to commit to a freebie without knowing its original market value. Hence, it’s amazing that the brand has the portable air cooler’s price written on the same advertisement. It effectively erases the shoppers’ worry that they might pay more than they should. The fusion seen above should clue you in that you don’t always have to choose just one advertising idea. There may be two you can’t decide on, yet what if success comes when you put them together? Now, no one can disagree that #itallstarts with Nescafé. In case you need help on this matter, chat with ODM representatives today! Promotional Toys in Singapore’s National Day Fun Pack!